Homeschool moms often find they have to teach children in multiple grades. Many homeschool moms, including me, have struggled to figure out how to do this successfully. Though it may seem next impossible to do, it is not. You can homeschool multiple grades without having a mental meltdown or pulling out your hair. If you exercise a bit of creativity and use proper planning, you too can successfully teach more than one child. The key is finding what works best for you and your children. Here are four strategies I use to successfully homeschool multiple grades. Teach subjects together whenever possible. Combining subjects is a fantastic way to teach multiple grade levels. When subjects are combined, the same information is shared with many children at once. In our home, combined subjects include science, social studies, art, music, and Bible. I use use the unit study approach when combining subjects. Use the unit study approach. This is my favorite way to teach multiple grade levels. It works well because I am able to teach the general topic to multiple grade levels and then tailor specific activities for each grade level. So, if we’re working our way through a unit on the systems of the human body, all children will listen to the reading about the circulatory system, participate in the discussion about what was read, and watch a video about how the circulatory system works. Later, younger children will draw a picture of the circulatory system and/or identify the parts of the circulatory system in a diagram. Older children will write a paragraph about how the circulatory system works or create a clay model of the system. I’m teaching the same topic but just using different applications based on grade and ability. Divide and conquer. Because subjects like math and writing tend to take more time to teach and can be more complex, some subjects must be taught on grade level and therefore, separately. The “divide and conquer” method allows me to have one-on-one instructional time with each child every day, but ensures the remaining children are involved in meaningful and educational opportunities as well. Foe example, in the morning while I’m helping a child edit an essay, the other two children may be creating awesome things in our Makerspace. In the afternoon, while I’m teaching a math lesson to one child, my preschooler is doing her preschool activities as my older child is typing the final copy of the essay we edited earlier in the day. Enroll children in online classes. The internet is a goldmine for the homeschool mom. There are many online classes and activities based on a variety of subjects and interests. These online classes can serve as your complete curriculum or be used as supplemental curriculum enhancements. Though we do not use a complete online curriculum, my children have taken online Spanish classes and participated in an online book club at over at Currclick. Online classes work well for moms homeschooling multiple grade levels because you’re free to work with other children while one or more are actively engaged in an online class. 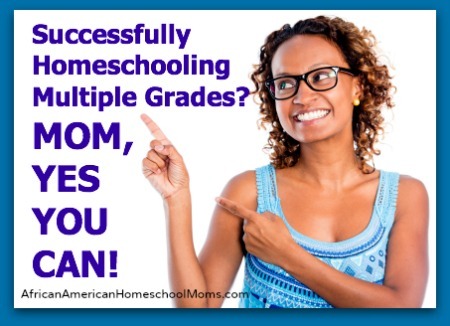 At first glance, homeschooling multiple grade levels may seem confusing, but you can do it! Try doing so slowly by utilizing one of the techniques I mentioned. If you have any questions, feel free to leave a comment or use the contact page to send me an inquiry email. Yes you’re right!!! this blog eliminates many of mom’ s worries about homeschooling their children in multiple grades. the general perception of homeschooling mom’s is that they feel hard to manage teaching children of different grades. Instead one can follow a unique approach like you. This blog serves as a resource for the mom’s to know how to educate their children of multiple grades.